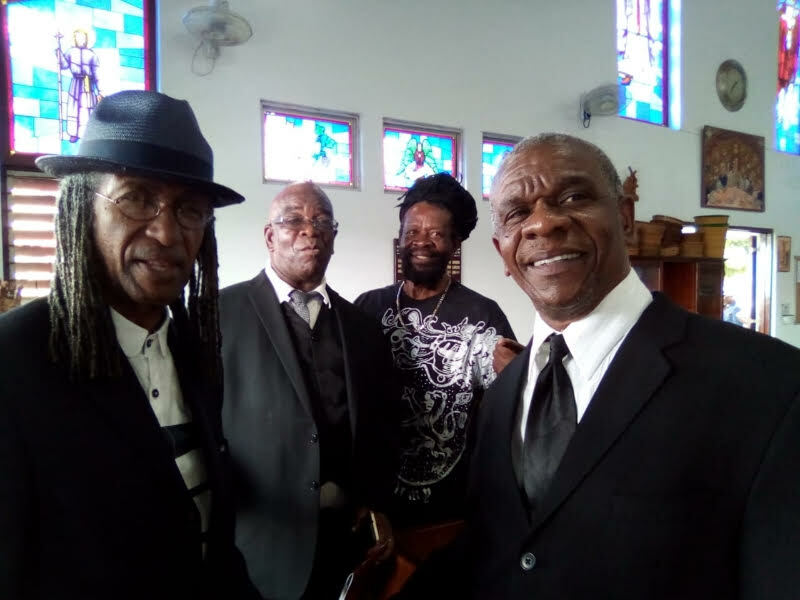 PHOTO CAPTION: Drummer Sly Dunbar, Christopher Irving, bass guitarist Errol "Flabba Holt" Carter and Franklyn Irving at the thanksgiving service for Channel One founder Joseph "JoJo" Hoo-Kim. The service was held at Stella Maris Roman Catholic Church in Kingston, Jamaica on October 20. Joseph “JoJo” Hoo-Kim, the Jamaican music producer who died on September 20, got a hero’s sendoff on October 20 in Kingston, Jamaica. A number of entertainment industry stalwarts who worked with him turned out at his thanksgiving service at Stella Maris Roman Catholic Church to pay their respects. Hoo-Kim was 75 years-old when he died from liver cancer in New York City. 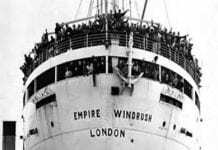 He was the eldest of four brothers who ran the successful Channel One recording studio in Kingston. The complex, which opened in 1972, was located in the tough Maxfield Avenue community; it produced songs that reflected Jamaica’s turbulent political climate of the 1970s. During that period, Hoo-Kim guided a team of creative musicians and engineers on songs like I Need A Roof by The Mighty Diamonds, Jah Jah Give us Life by The Wailing Souls and Leroy Smart’s Ballistic Affair. “It was good to see a lot of people who JoJo help come an’ show dem face, like (producers) Gussie (Clarke) and (Donovan) Germain. 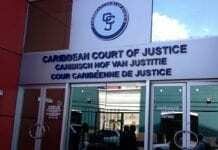 I used to see dem at Channel One when dem jus’ start,” said Franklyn Irving, a close friend of the Hoo-Kim family. Irving and his older brother Christopher Irving, former manager at Channel One, attended the service. So too Hoo-Kim’s younger brother Ernest, chief engineer at Channel One; drummer Sly Dunbar, a member of The Revolutionaries, the studio’s house band; Dunbar’s longtime musical partner, bass guitarist Robbie Shakespeare, bassist Lloyd Parks, Jamaica’s entertainment minister Olivia Grange, music producer Winston “Niney” Holness and Tabby and Judge of The Mighty Diamonds. Hoo-Kim is survived by his wife Joyce, eleven children and several grandchildren.